Graham Greene originally divided his works into novels and ‘entertainments’, separating his popular work from those he wished his literary career to be remembered for. In later life, this distinction would be blurred until it was dropped entirely. 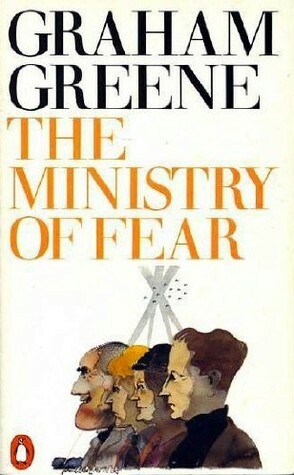 The Ministry of Fear is one of these earlier works labelled an entertainment. Made a year later into a film directed by Fritz Lang, it was written in the middle of wartime, and on the surface is a typical espionage thriller in the tradition of John Buchan’s The Thirty-Nine Steps, dealing with a Nazi spy ring operating in London during the blitz. On its own, the plot is gripping enough to carry the book through to the end, and those bits we can regard as ‘entertainment’ made their way into the film. But as with many of Greene’s works, it’s the inner conflict which is missing from the silver screen translation. We learn early on that the main protagonist is racked by guilt over the murder–what we would today most likely see only as a mercy killing–of his wife. This concentration on the individual, amid the scaled chaos of the blitz, makes this short novel so interesting. Much of it seems quite dated now, but there is still plenty of relevance in a society trying to come to terms with the issue of euthanasia. Aside from the juxtaposition of a thrilling little spy plot and the psychological reflections, this short book is also an advert for Greene’s art. The writing is simply superb, an absolute pleasure to read, full of inventiveness without the overt self-conceit of trying too hard. Another reviewer pointed out that this short novel took longer to read than he had imagined. I’d suggest that comes as a result of needing to read every word and understand it, not skim over lines of trite, repetitive text as in many other novels. To skim would be to rob oneself of most of the pleasure. For me, Graham Greene remains the greatest English language novelist never to have won the Nobel Prize. As an entertainment, rather than a novel, The Ministry of Fear lends itself as an excellent introduction to his greater literature.